April | 2018 | Mothers Against Wind Turbines Inc.
“Ellen Andrew-Kasper says she struggles to stay awake when she drives because of lack of sleep; David Kennedy leaves home to avoid headaches caused by the flicker of light and shadow through his windows, and Valerie Vitali thought she was having neurological problems from the same light and shadow flicker. Residents fight to protect endangered Blanding’s turtles as unwanted construction of industrial wind proceeds with the invasion of Amherst Island. Ontario meanwhile fails to enforce its own rules and ruling of the Environmental Review Tribunal. Additionally, the Tribunal finds that the mitigation measures incorporated as conditions of the REA have all but eliminated the potential for turtle mortality and have minimized the potential for indirect impacts to habitat during the construction phase. The construction window of November 1 to March 31 for those portions of the Project closest to the coastal wetlands, and the window of September 1 to March 31 for the remainder of the Project, will ensure that construction takes place outside the period during which turtles are active outside of their resident wetlands. Environment, ERT Appeal, fighting big wind., Green Energy, harm to wildlife, Unite the Fight! Meet at Royal Road & Lighthall Road, South Marysburgh. ( Scientific name: Cathartes aurahave). These raptors soar long distances riding high on thermals of air with long outstretched wings. They hunt not by sight, but by an acute sense of smell searching for carrion to feast upon. Social, gregarious and highly intelligent they are often seen flying, feeding and roosting in communal groups. One of their unique forms of protection against threats is the ability to projectile vomit acidic stomach contents at will. Difficult birds to launch from the ground they take running leaps to lift off and can jettison stomach contents to lighten their weight to aid becoming airborne. They are meticulous about their personal hygiene and serve an essential function as clean- up crews for the environment. Notice the wind turbine blade sweep movement results in driving a bird downwards out of a soaring climb. Turbine blade sweep is part of increasing environmental habitat fragmentation and disruption created by wind facilities construction and operations. Mortality strikes (kills) occur in airspace directly disrupted by turbine blade sweeps. As increasing numbers of wind turbines are erected increased adverse environmental impacts are occurring for avian species. Habitat disrupted or avoidance= habitat loss. Impacts are not only local but include those on a global scale. Flying the global flyways has become an even more dangerous journey with annual migrations spiked with increasing 1000s of wind turbines. Wind power is disrupting avian movements and prefered habitat use on a local and world-wide basis which begs the question: How sustaining and green is that? 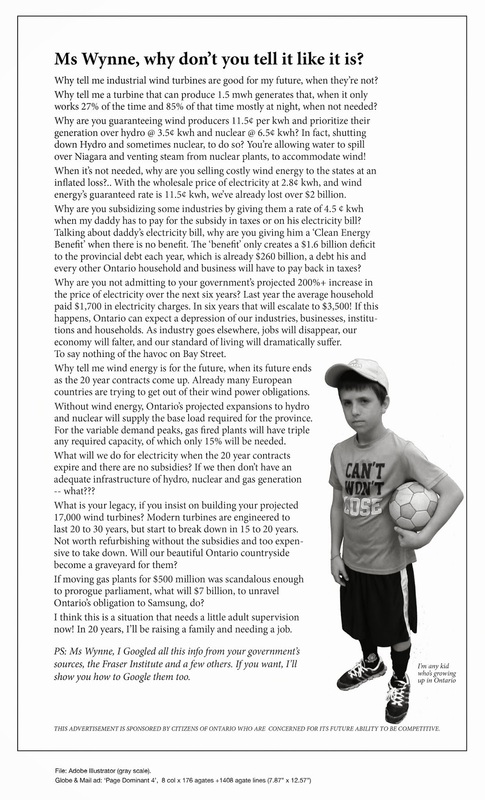 The people of Chatham-Kent aren’t stupid and it makes us a little angry when the powers that be assume we are. The news this week about the EBS Geostructural Consultant blog that had a key phrase removed regarding the company’s advice to Hydro One about using micro-piling methods instead of deep piling to avoid “potential for driven pile installation to cause issues with nearby active water wells” is disturbing on so many levels. First, the advice to Hydro One is proof at least one government agency used alternative methods of pile-driving to avoid disturbing area water wells, with the blessing of the Ministry of the Environment, as the blog states. Second, it refutes the claims by the North Kent One wind farm that there couldn’t possibly be any connection between deep pile driving methods used to construct the turbine foundations and the complaints of sediment contamination in several water wells in the project area. And finally, removing the line referring to water wells doesn’t make us “unsee” the information. We now know at least one government agency – Hydro One – sought advice on how to construct towers with the least impact to area wells and went with that advice, keeping in line with the company commitment to “identify and evaluate environmental risks to ensure that hazards are eliminated or controlled” as it states on its website. So asking us to disregard what we read because it wasn’t being “used properly” and expecting us to believe this advice is not in any report to Hydro One is utterly ridiculous and, frankly, insulting. If Samsung and Pattern are going to stick to their assertion their construction methods couldn’t possibly be the problem for well owners, and if the environment ministry and municipal officials are going to buy into that when other sources say otherwise, it is time for us all to demand better from our deciison makers. The well owners have been dealing with dirty water for long enough. We need to start questioning why the environment ministry and the municipality are letting the turbine companies dictate what we consider unsafe for our rural residents, and why these well owners have to fund their own investigation into the potential carcinogenic sediment in the water the government insists is safe to drink. And because our chief medical officer of health says so isn’t a good enough reason. Until the governments – local and provincial – step up and demand answers from an unbiased third party, we will continue to be treated as naïve sheep who need to be neither seen nor heard.